This is the pain-free way to remove moss, weed and algae from block paving pathways and even garden decking. Say goodbye to expensive chemicals and messy power washes. The new 2 and 1 Patio and Decking Cleaning Brush will have your driveway looking as good as new in no time and your decking slip free! Designed to clean & weed block paving, decking & more. The Gouging Tool is set at just the right angle for comfortable removal of moss & weeds. This is a perfect decking cleaning brush because the brass coated steel bristles are durable but soft enough to clean between decking grooves and it has a long wooden handle making it comfortable and easy to use. It’s also super easy to fit replacement heads meaning you don’t have to replace the entire brush just the heads. The built-in weeding tool is strong durable and the perfect shape to get right down to the roots of weeds even removing moss from the joint of block paving is a breeze. It’s just the right ankle to cut and lift the moss clean away. It’s so easy! For the best results always pull the brush towards you with gentle strokes. Now turn the brush head over and the brass coated bristles finish the job, removing any final surface moss and algae for a perfect result. Getting down on your hands and knees with a scrapper or a knife just takes ages. Not to mention the backache. The long handle of the 2 in 1 paving and decking cleaning brush means you can now sweep and clean without the pain of bending over. 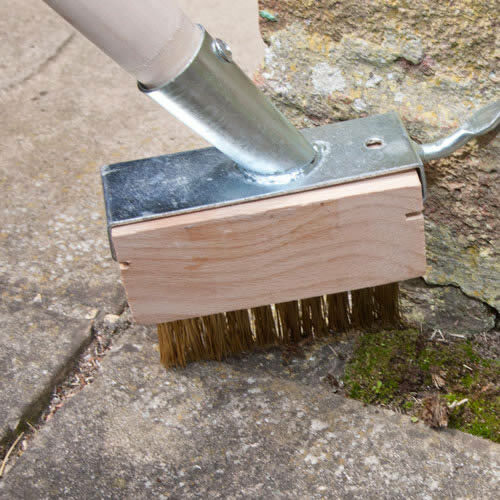 This brush even works in the tight corners where walls meet paths and driveways. If you should wear out the bristles the replacement brush head is easy to change, simply remove the screw and slide the brush head out. Now fit the replacement head and the Decking Cleaning Brush is ready to go once again. So whether its block paving, pathways or garden decking, the 2 and 1 paving and decking cleaning brush is just what you need! It’s available at Caraselle Direct – why not pick up a replacement head for 2 in 1 patio & decking brush too? Very good quality, would recommend to family and friends.